When I moved to my house in January 19 years ago with my 7 cats, I soon noticed a young ginger tom cat sitting in my garden. He was looking in at us, while my own cats, who had not yet been outside, stared back at him. I discovered that he belonged to one of my new neighbours. Ginge continued to visit me right through till Spring, although his visits were far from friendly. If I spoke to him, he would hiss and "swear" at me or even swipe at my leg if I dared to walk past him! He certainly wasn't a very friendly cat. Ginge was not neutered and had probably fathered quite a few kitties so I decided to get him neutered myself, as his owner did not see him for days at a time. On occasion,I tried to return him to his owner in a cat basket, but Ginge was persistent and just kept on coming back. By now he had accepted me and claimed my garden as his own by spraying everything in it - including me,unfortunately! 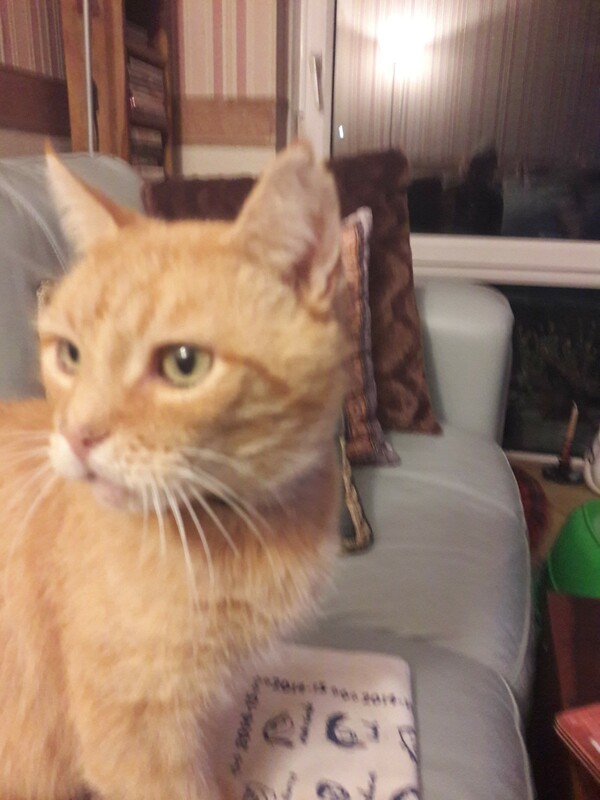 When he was 13, Ginge simply stopped going back to his previous home and decided to adopt me and move in full-time. His previous owners were quite happy with the situation as they now had a dog. He continued being the dominant tom and all the other cats in the neighbourhood gave him a wide berth. I have an elderly neighbour who is very good about my cats visiting her and she once commented "that ginger cat has taken over your house" and he certainly has! I have never even considered rehoming him.